1983 YZR500 (0W70) - Communication Plaza | Yamaha Motor Co., Ltd. 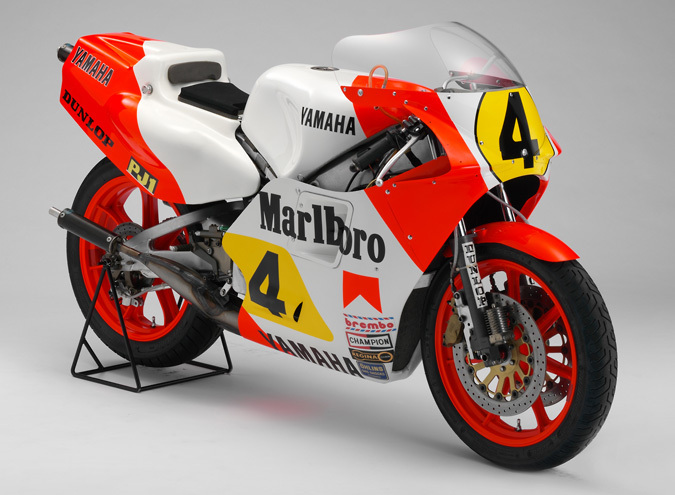 This factory machine was the successor to the 1982 model YZR500 (0W61), inheriting its V4 engine. It also featured significant new developments in its aluminum frame to become the new “Deltabox” type and adopted a 17-inch front wheel for greatly improved handling stability. This was the machine used in a closely fought GP500 series that would go down in racing history with Kenny Roberts and Freddie Spencer winning six rounds each in their rivalry for the championship title.